Brinjal Chips is a crispy, yummy recipe. 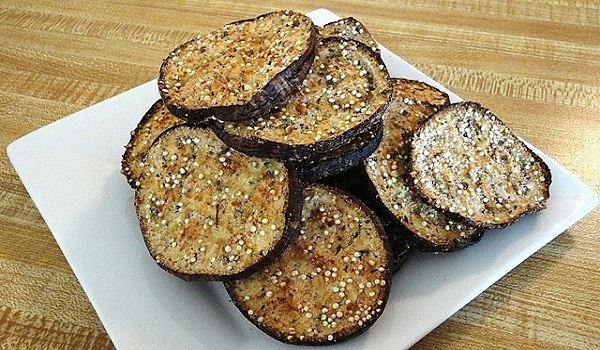 Learn how to make/prepare Brinjal Chips by following this easy recipe. Slice the Brinjals into round shape after washing them properly. Add red chili powder, turmeric powder and salt to the ginger garlic paste. Smear a little paste on each slice of brinjal, making sure that the layer of paste is thin and on both sides of brinjal. Heat a frying pan and place these slices in the pan. Shallow fry brinjal slices, turning them over frequently. Remove them from the pan and drain the excess oil if any, on a tissue paper.